a) The same kind of plants grown and cultivated on a large scale at a place is called _______. b) The first step before growing crops is ______of the soil. c) Damaged seeds would _____ on top of the water. d) For growing of crop, sufficient sunlight and ______and _____ from the soil are essential. b) Urea and super phosphate. c) Animal excreta, cow dung, urine & plant-waste. 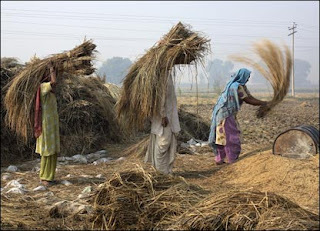 Question.3: Give two examples of each: (a) Kharif crop, (b) Rabi crop. Sowing is the most important part of the crop production in which seeds are implanted in the prepared soil. Before sowing only clean, healthy, good-variety and high yield seeds are segregated and sowed in the fields. In the traditional method of sowing seeds, a long pipe is used which has a funnel at its one end and the other end pierce into the soil through which seeds are placed. Now a days a machine or a tool known as seed drill is also used for sowing with the help of tractors. A seed drill saves time & labour. While sowing the seeds care should be taken to maintain proper distance and depth between the seeds to prevent damage of the seeds caused by birds and also to prevent overcrowding of the plants. Unwanted plants growing along the crops are called weeds. The process of removal of weeds is called weeding. Weeding is necessary since these weeds absorb the water, nutrients, space and light meant for the crop plants. Weeding can be done manually with a ‘khurpi’ or mechanically with the help of a ‘seed drill’ or even using certain chemical called ‘Weedicides’. The best period for weeding is during their vegetative phase before flowering or bearing seeds. When the crops are harvested they are cut along with the stalks. They are then, separated and the grains are removed. This process of separation of grains from the chaff is called ‘Threshing’. This whole process is carried out with a machine called ‘Combine’ which is in fact a combined harvester & thresher. Question.5: Explain how fertilizers are different from manure. Fertilizers are chemical substances, while the manures are the organic substances (decay of plants & animal wastes). Fertilizers are prepared in the factories, while the manures are prepared in fields. Fertilizers don’t provide any humus to soil, while manures provide a lot of humus. Fertilizers are rich in plant nutrients like- Nitrogen, Phosphorus & Potassium but manures are less rich in plant nutrients. b) It makes soil porous due to which exchange of gases becomes easy. c) It improves the texture of soil and also increases the number of friendly microbes. Question.6: What is irrigation? Describe two methods of irrigation which conserve water. (i) Sprinklers: Sprinklers work like fountains. Long perpendicular pipes having rotating nozzles on the top are joined to the main pipe lines at regular distances. When water is supplied, it comes out of these rotating nozzles which sprinkle water in all directions. Limited outflow of water, controls wastage of water. This method is more suitable for uneven and sandy soil. (ii) Drip System: This system allows the water to flow drop by drop at the roots of the plants. It contains a main pipe which has further lateral pipes containing small nozzles for the outflow of the water. Nozzles are such placed that they throw water at the roots of the plants, which saves water from flowing around uselessly. This technique is best suited for watering fruit plants, gardens and trees where availability of water is poor. Question.7: If wheat is sown in kharif season, what would happen? Discuss. Question.8: Explain how soils get affected by the continuous plantation of crops in a field. Question.9: What are weeds? How can we control them? Answer: Weeds are the unwanted plants growing along crops. They share the nutrients meant for plants and thus are harmful for crop. We can control weeds with the help of chemicals Weedicides. The removal of weeds is called weeding. They are either, removed manually or by chemicals. Manually this can be done with the help of Khurpi or Seed-drill. Weedicides are sprayed in the fields to kill the unwanted plants. These weedicides do not affect the main crop. Weeds are removed or killed during their vegetative phase before flowering or bearing of seeds.